Last Full Week of September! We have had a wonderful and warm week of learning here in Room 16! Math ~ We have been working on place value to the millions, rounding to the thousands and adding larger numbers. Please check your child’s folder for a couple of quizzes and assessments that we have taken this week. Reading ~ We are continuing to work on choosing “Just Right” books for our in class reading workshop time and our 20 minutes of reading homework. Reading homework is assigned 5 nights a week. Please make sure that your child is filling out their reading log EVERY night and returning it to school the next day. The reading logs are then turned in on the following Monday. This week we have also worked on reading strategies. Sometimes as we read the movie we are creating in our mind goes blurry. The first step is to not ignore it when things don’t make sense. We can keep reading to see if it clears up (like a dream sequence) or reread in case we missed something. We need to say “huh?” to ourselves and try to figure it out. We decided we want to treat reading like books are gold and not be curmudgeons. Attitude toward reading is half the battle.We also learned how to “BUZZ” about books to give book recommendations to our friends. Writing ~ We are starting our first writing unit and we are each writing a realistic fiction story. Students learned how fiction writers get ideas for stories and sketched out their main character. Students thought about the problem their character has, internal traits, external traits, how their character acts and how others view their character. Science ~ We are learning all about the moon! We learned about moon phases, why the moon seems to change and we talked about the full eclipse of the super moon this weekend on Sunday night! Thank you to all the parents that donated Oreo cookies for our moon phase project on Tuesday. We will be taking a trip to the planetarium at White Pines Middle School in a couple of weeks! Please remember that Spelling Tests are every Friday! Library is on Friday too! All daily assignments are on your child’s iPad in their My Homework app. Janie’s Cookie Dough order forms went home today to the students who are fundraising for Chicago. If your child did not bring home a form and you would like to order or sell cookie dough and other yummy treats, send me a note or email and I can send an extra form home with your child. Friday, September 25 – Chicago payment choice paper is due and Janie’s Cookie Dough Fund Raiser begins. If you signed up to fund raise then your child will receive a packet of information and may begin taking orders and money. Wow! Has it been one hot week! Whew! We have has a lot of great learning happen in our classroom this week! In reading we have talked about the importance of reading books that are at your “Just Right” level. Students have practiced reading longer and stronger, reading with expression and guarding against reading on autopilot. We have talked about reading ourselves awake! This week in math we started with some place value review and we also reviewed the rules for rounding. Students then learned how to round to the thousands. Students also practiced reading and writing large numbers. we worked with numbers into the millions! There is a small bit of math homework this weekend. Your child’s homework will be on their ipad. Ask them to show you how they use Notability to annotate on a pdf document (their math homework). In writing the students wrote three different on demand pieces that will help me assess where they are at and what they need to work on to move forward. We also became bloggers today! Students learned how to use Kidblog and wrote their very first blogs using our ipads! Ask your child to show you their blog! This week in Science we learned about weather tracking and the tools used to measure wind and temperature. We also talked about the moon. Your child has been asked to make at least one observation of the moon in the next two weeks and record it on their Moon Observation Log sheet. Ipads are coming home with Mrs. Lannon’s class tonight! The students will be bringing home their ipads, chargers and charging cords tonight. It is their responsibility to make sure that their ipad comes to school with them EVERY day and that it comes fully charged. Encourage your child to explore the apps on their ipad. This week we have learned how to use Notability. We will be using this app daily to do our in class math work as well as our math homework! As with any new program, their can be frustrations when learning how to use it. We are working on being patient and persevering even if we are getting frustrated. Think of the first time you learned how to use a new computer program, there is a learning curve. I have asked them to try it out and give it at least a week before they decide if they like or not, if they can do it or not. As I said, they are just starting to learn all the ins and out of the app. Please remember to refer to your ipad handbook that came home on the first day for all of the ipad rules. We have had an awesome first week of school! We have spent our time together getting to know each other, setting up our classroom rules, we even created our class constitution! Next week will be our first full week of school! We will be diving right in to our curriculum, so please expect to see Math homework Monday – Thursday, Spelling homework will come home Tuesday night and is due on Friday, there is also 20 minutes of reading that is assigned each night. students are required to read their baggie book and then log their reading in their reading log. I am still waiting on just a few more ipad consent forms, I am hoping that ipads will come home early next week. Here are the photos from the first day. For some reason, my slideshow is not working. Wow! This morning flew by! 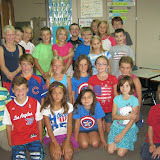 I loved meeting my new fourth graders! I can tell that we are going to have a great year and a lot of fun! Some important papers went home today, the iPad consent/insurance and apple id information and the iPad handbook. The iPad handbook is attached to the apple id instructions. You will need to wait to receive your email from the technology department to set up your child’s apple id for school. These emails should go out today or tomorrow. Unfortunately, you can not send in the consent and insurance money without this as the apple id and password need to be written on the back of the consent form. Your child also has a little bit of homework tonight. They should be filling up the Me Bag that went home today, instructions are attached to the bag. Have a great day, remember tomorrow is a FULL day of school! I enjoyed having the opportunity to meet so many of you at Open House. I can already tell that we will have an awesome class this year! Thank you for taking the time to come! At Open House their were many items on your child’s desk, including Chicago Field Trip information and a letter from me. I know how hectic this time of year can be, so I have included a copy of those notes below in case you need them. If you were unable to attend Open House, I will send home those papers with your child on the first day of school. iPad Handbooks, consent forms, insurance information and apple ID sign up information will go home on Tuesday. Please return these forms ASAP. As soon as all forms are back we can begin to send the iPads home! Don’t forget to subscribe to this blog, and you will receive an email when I updated it. Rest and relax today, get a good night’s sleep and I will see you in the morning!